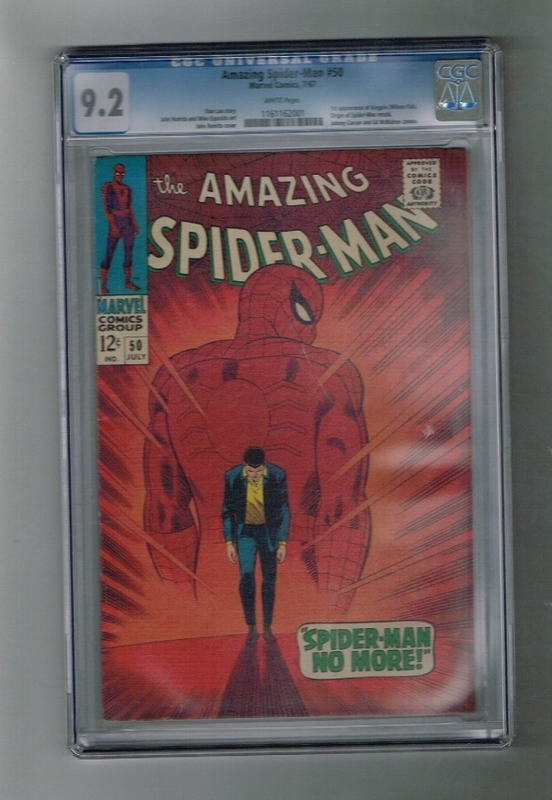 AMAZING SPIDER-MAN #50 CGC Grade 9.2 Silver Age key issue: 1st KINGPIN! Cover pencils by John Romita. First appearance of the Kingpin in Spider-Man No More!, script by Stan Lee, pencils by John Romita, inks by Mike Esposito [as Mickey Dimeo]; Fearing for his aunt's health and tired of being hounded by Jameson, Peter gives up being Spider-Man and concentrates on being a simple college student; A kid finds the discarded Spidey suit in the trash can and brings it to the Daily Bugle where Jonah proudly puts it on display; Pete's personal life starts looking up but crime increases as the Kingpin gathers the mob under his leadership; Feeling guilty about the crime wave, Peter remembers the lessons taught to him by his uncle's death and decides to become Spider-Man once again. Johnny Carson and Ed McMahon cameos. Reprinted in Marvel Tales #190. 36 pgs. Since we value our customers so much, we NEVER use "stock photos". We take the time to photograph or scan each item ourselves so you can buy with confidence! Yes, we do offer multiple purchase shipping discounts. Be sure to add yourself to our store eNewsletter. Your privacy is important to us and as such we do not share or sell any customer information! Falsifying customs forms is a crime. All items will be marked as "merchandise"
and shall have the exact purchase price.